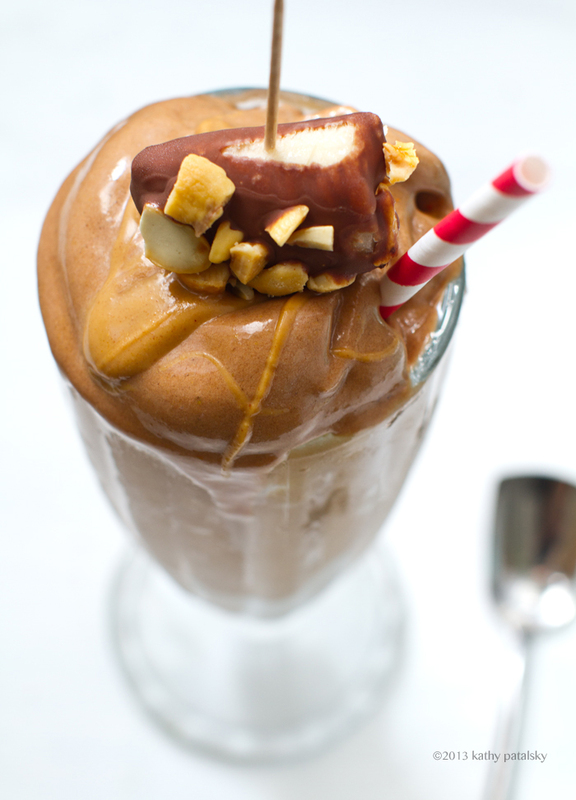 Vegan Shake: Peanut Butter Chocolate-Dipped Frozen Banana. Need a frosty treat this week? (I sure did!) 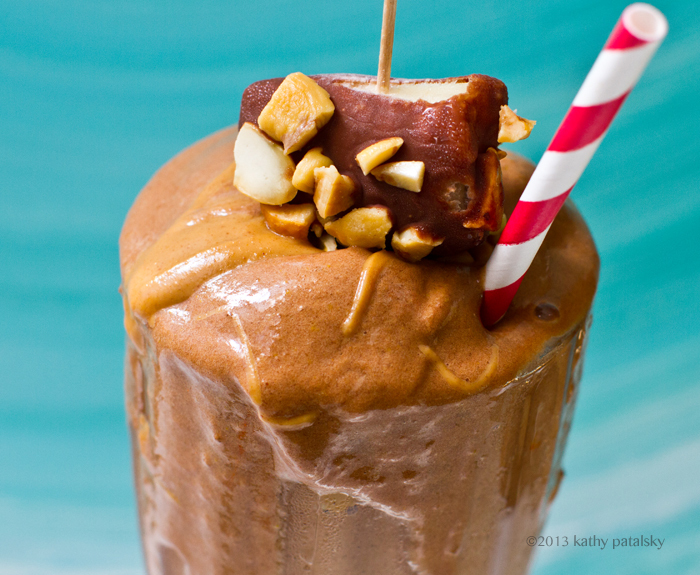 Try this Peanut Butter Chocolate-Dipped Frozen Banana Shake. It is actually a lot healthier than is appears and I love it because it combines two desserts in one. 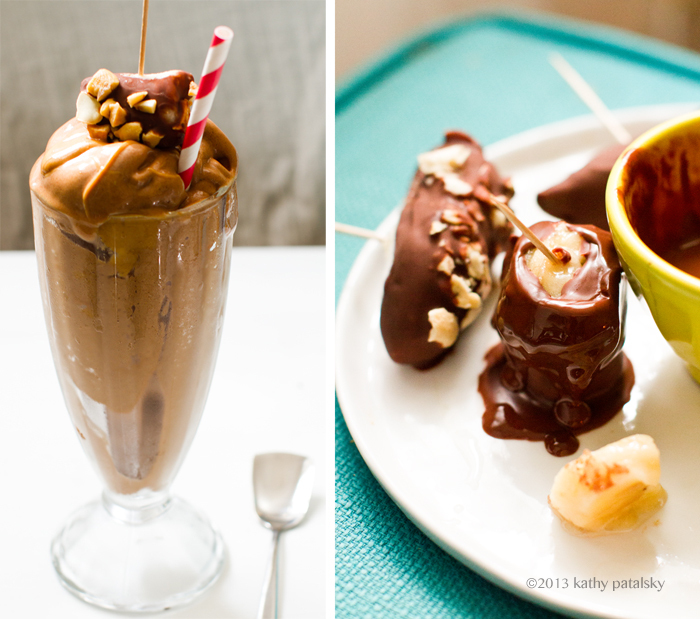 Chocolate-dipped bananas and a peanut butter-swirled chocolate "milk"shake. Oh and I have news to share about my book..
Happiness: The FindingVegan.com re-lauch has been going swimmingly! So many beautiful recipes being submitted by talented bloggers. And even if you do not have a blog, you should register for a profile because 1) You can save (heart) your favorite recipes and collect them in your private favorites page. And 2) You will want an account for an upcoming contest I will be holding here on HHL! Details to come. I found out some frustrating news about my book 365 Vegan Smoothies. It is one of those things where I am like, "Of course this happens to me! Why am I not surprised!" Le sigh. So. This week, my beautiful books arrived at my publisher's office in NYC. I'm sure they all gathered around the big box and eagerly pulled it open, ready to uncover an armful of freshly-printed, shiny-new smoothie books. I can only imagine their stunned faces when they saw it. So, to correct thing, they are rushing to have the books re-printed ASAP. But not in time for June 4th, I'm afraid. The Good News! The good news is that the INSIDE of the book (I am told) was printed perfectly and looks BEAUTIFUL. Those many color smoothie photos glistening amidst the pages and pages of smoothie tips, recipes and goodies. So what does this mean? Well this means, my very patient readers, that 365 Vegan Smoothies will not be ready until July 2nd. Say it with me now: "Boooo!" Trust me, I am as sad as you are. And FYI you guys are the first to hear this. Even Amazon.com seems to still think my book is coming June 4th, but that will be updated in a few days.. So for everyone who pre-ordered (and I am excited to say there are a lot of you!) I am SO SORRY about the delay. But come July, your books will be ready .. and free of those pesky errors. 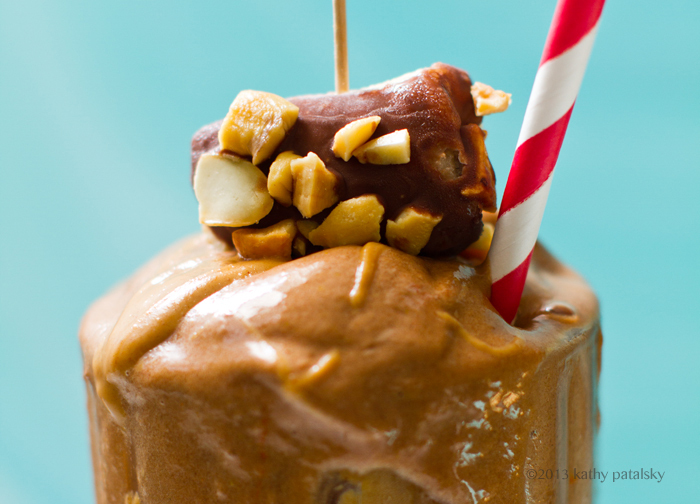 Frosty delicious peanut butter chocolate shake with yummy vegan freezer banana bites on top! First make your banana bites, these are easy to make and will be ready in about ten minutes. 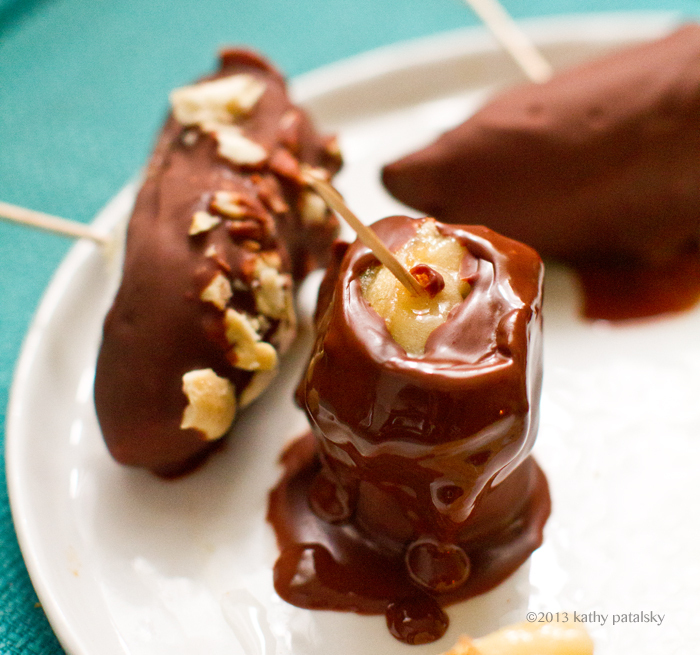 You need to use frozen bananas so that the chocolate freezes / hardens easily on the bananas. Pull pre-sliced frozen bananas from the freezer. In a small bowl, add the chocolate chips and coconut oil. Melt in microwave. 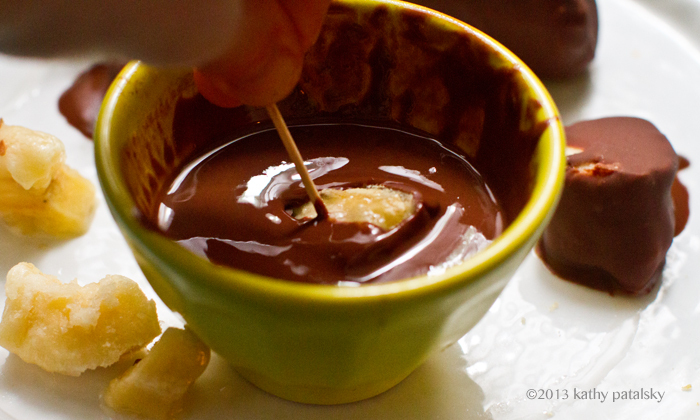 Start dipping your bananas in the chocolate. I used toothpicks to help me dip. Then dip the bananas in optional crushed nuts. Place the dipped bananas on parchment paper or a greased freezer-friendly plate. Place in the freezer and they should be nice and frozen in 5-10 minutes. For the shake, simply add all the ingredients to your blender and start blending. 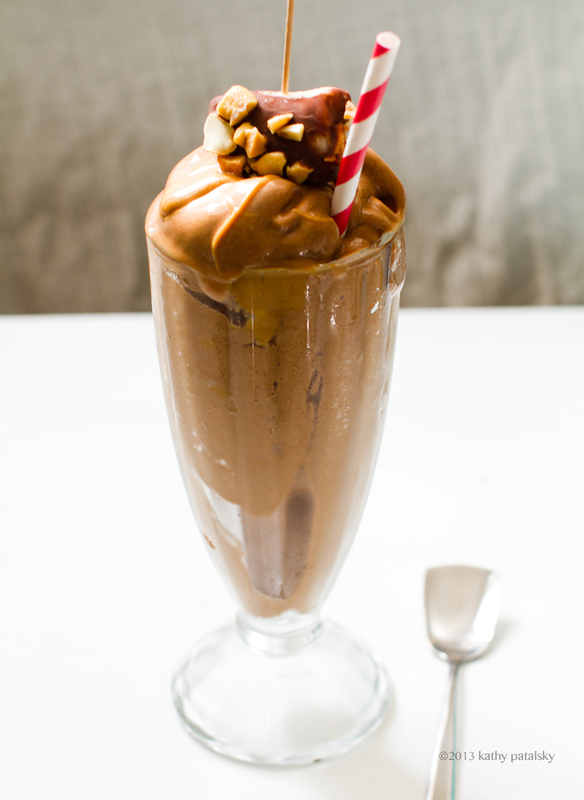 To serve, drizzle softened nut butter in between the layers of chocolate shake and over top. Garnish with a frozen banana. 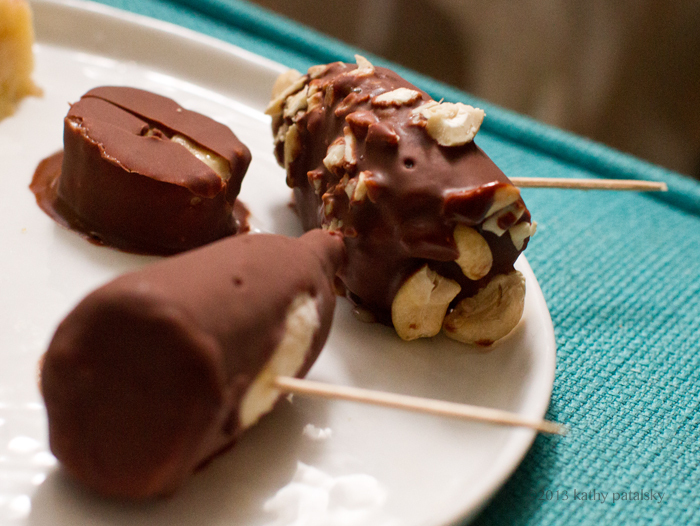 You will have plenty of leftover dipped chocolate bananas, store them in the freezer. 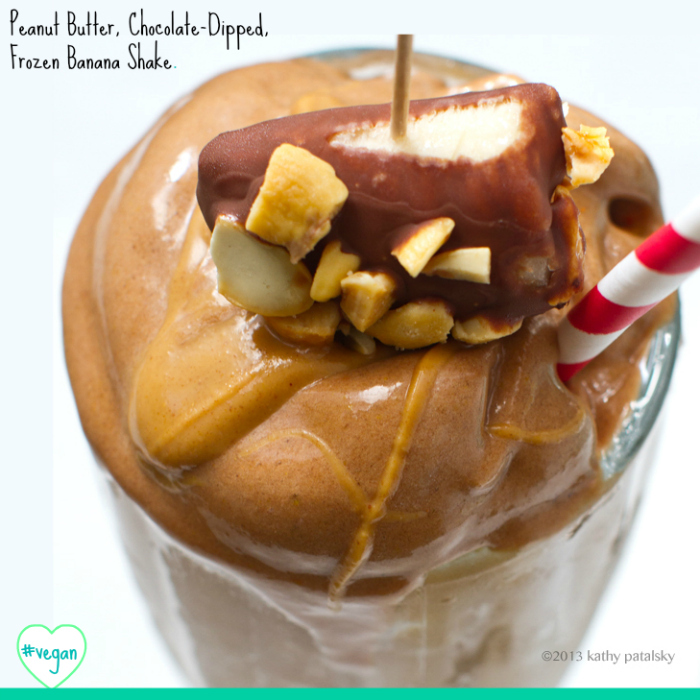 Lets all chocolate-pb shake cheer together, yes?